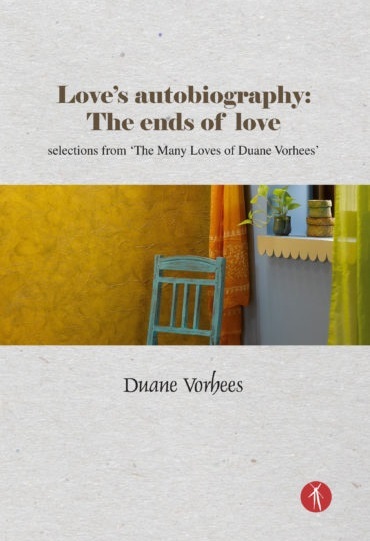 From the first poem, which states: “The ends of love /are but two”, to the last poem which declares, “Why, no, I’m not even bored!”, Duane Vorhees’ recent poetry book, LOVE’S AUTOBIOGRAPHY: THE ENDS OF LOVE, is a “whizdizzyingly” read. for the horizon to rise and beat the daylights out of the / sun”. And from the poem, “MY FINGERS”, he states: “My fingers have ridden through the forests of your hair / and slept on belly-gold prairies”. But within this poetic language and lustful imagery we must not forget that the purpose of this collection is to make known, “The Many Loves of Duane Vorhees”, which is the subtitle of this poetry book that leads us to the chapter titles of these precious women: “Beth”, “Jenny”, and “Yeobo”. just billow our charms / wrap our sheets round yardarms entwined”. “Visit me in my mushroom tower and I will come to you / down this deep dark ditch amid tinder black flowers / down to the buttercups and dew”. These paths unmapped and all my everythings nones”, only to move into this truth: “without you Beth my life's another burial ground”. “I know why the sky sings the blues — for you, Jenny, for you”. This is the opening line of the first poem of the “Jenny” chapter, which is as rich in desire as love it self. 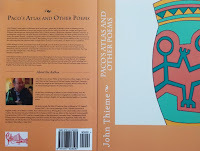 A quick note here: My feeling about the interior design of this collection is, I would like to see a name chapter-page for each lover before the start of the poems, so that the reader doesn’t have to reference the table of contents to see whom the poet is yearning for. till I rest in the hollow of your thighs”. “Wrapped like a glove on the dresser. Lovely warm soft / leather. Carefully crafted. Turned nicely out. Waiting for / the proper hand”. And this seems like the climax to out-do all climaxes: “Imagine our bodies in Braille / finger tongues perusing / teasing out nuances / weighing every significance / We turn over / sheet after sheet / Each climax foreshadowed / we read ourselves to sleep”. and wrap it in your arms”. “Take me in … take me in”, while making “the moon turn the tides into whales against glittery crystal chandelier yachts”. With this chapter it’s obvious to understand that Vorhees “rose out of the nursery and went to conquer Love” and knows how to translate his victory into poetry lines that are pages of unexpected moisture “running across your face” and “lying between your thighs” and are “devoted to the many aspects of romantic (and sometimes anti-romantic) relationships”. Weighing in at sixty-four pages and forty-forty poems, this collection is a heavyweight in love, passion, yearning, and loss, as the poet takes his readers through the many stages of his “appetite and whims” and “the secret vacuum” of his heart that “no intruder can penetrate”, where he howls for his women and their “exclusive delights” and “breaths of lovers with joys unmatched”, as Duane Vorhees professes: “I hand-n-knees my way inside where moist warmth is / plentiful”.